> It has been 35 years since the BVI Christian Council, LIONS, and Leo Club of the BVI has been igniting the spirit of Christmas in the hearts of the residents of the Territory. 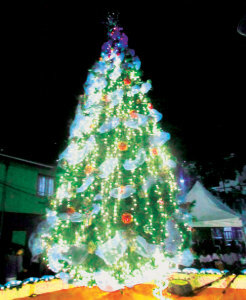 Each year Christmas in the Virgin Islands commences with the lighting of the giant Christmas tree at the Sir Olva Georges Plaza, and likewise this year. The only twist was that many thanked the organizations responsible for this Christmas sparkle this year. > President of the LIONS Club of Tortola, Mr. Heskith Newton announced that traditionally the Christmas tree lighting heralds in the Christmas season here in the BVI and serves to remind the Clubs just how important its work is in the community. Lion Marvin Grant First Vice-District Governor 60B-LIONS Clubs International said that the lighting initiative gets better and better each year with the various trees being more beautifully decorated. Acting Governor, Inez V. Archibald was given the honour of lighting the large Christmas tree that for the remainder of the year would be the focal of the Sir Olva Georges Plaza. Persons present at the event were entertained by several performances including: Long time participant Marion Scatliffe, Kamau Georges, G-Smooth, Foggy Mountain Boys, National Boys Choir, Monique Chapdelaine etc. Over the years, the Lions Club of Tortola has executed a number of projects in the Territory and assisted the less fortunate in the community. Some of the projects include the annual Christmas tree lighting, Christmas baskets distribution to the needy, Sight First Programme for primary school students, signs restoration throughout the Territory and the first Special Olympics Games now called Special Needs Games.